The Indian media has made an art form of manufacturing controversies where they don’t exist. When it comes to Russia, there are also enough armchair critics, who are nostalgic of the Soviet days, trying to stir the pot. In 2004, when Vladimir Putin visited India for the annual India-Russia summit, he was facing international isolation in the wake of the ‘Orange Revolution’ in Ukraine. Things weren’t as bad when it came to Moscow’s relations with its neighbour as they are now, but the Russian president’s image was taking a beating thanks to a barrage of western propaganda. In the Indian capital, he was given a red carpet welcome and was happy with the outcome of his meeting with Atal Bihari Vajpayee. That was, until he was told of mischievous reports in many leading dailies in India. They misquoted his statements about Russia supporting India’s bid to become a permanent member of the United Nations Security Council. Putin said that he was in favour of India joining the elite club at the UN but also mentioned that the permanent members should not lose their veto right. The papers accused him of saying he wanted India to become a permanent member sans the veto right. Putin actually had to clarify from Bangalore that he meant that he supported both India’s right to permanent membership and that of a veto. Similarly in 2011, two days after the annual summit in Moscow, which by all means was a success, a controversy erupted over some officials in Tomsk wanting to ban the ISKCON version of the Bhagawad Gita. Suddenly news channels and papers were accusing Russia of threatening to ban the Hindu holy book altogether, without even bothering to find out any details. The said case was quashed but those looking to manufacture a controversy had their way. I am reminded of these two incidents when I read reports making too much about the fact that the Narendra Modi-Vladimir Putin meeting was delayed by a day. Some pundits talked about how this could have been a deliberate message to India or that it reflected some sort of chill in bilateral ties. Such a conspiracy theory supported by retired diplomats and so-called experts borders on the ludicrous! Why on earth would Russia want to isolate one of its most important partners at this juncture when its ties with the West are at their worst since the Cold War? The media pundits also talk about defence ties being affected between the countries. This is coming at a time when Russia is openly showing a great degree of interest in working on joint projects with India, which involve the transfer of technology, the likes of which no other country would seriously be willing to even consider sharing. BrahMos, a model international defence partnership, continues to go from strength to strength, even earning the praise of Dr A P J Abdul Kalam. 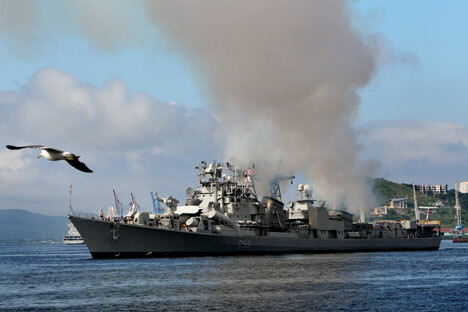 As I write this column, Indian ships are taking part in important strategic naval exercises off the coast of Vladivostok. There may be irritants in the defence relationship between India and Russia, but it would be foolhardy to say that the problems are as serious as some with vested interests in the media are trying to convey. Relations between New Delhi and Moscow are not like they were during the days of the Cold War. It’s time that Indian scribes and so-called experts stop looking at Russia as if it were the Soviet Union. India has also undergone dramatic changes from the days of the Cold War. It is no longer a newly independent country that needs a security guarantor. If anything, the Russian establishment respects the new, strong and economically and militarily powerful India. Moscow also understands India’s geopolitical compulsions and accepts that Indian foreign policy needs to be independent, keeping its own interests in mind. There is a lot of behind the scenes work going on when it comes to Indo-Russian bilateral agreements. Only a complete imbecile would have expected Putin and Modi to announce major deals on the sidelines of the just-concluded BRICS Summit in Brazil. The best markers to judge the state of bilateral relations would be the number and quality of agreements that will be announced after December’s India-Russia annual summit in New Delhi. Vladimir Putin’s potential visit to Kudankulam may be more than just symbolic considering that the two countries are now free to work out more nuclear deals according to a roadmap put in place two years ago. Several other areas of cooperation are also likely to get a boost, and for that we all need to let Indian and Russian officials and diplomats do their job in peace. Given the fact that some western governments are desperate to woo Modi’s India, look for a barrage of controversial articles surrounding Russia in the Indian media over the next few months. There are enough shameless scribes who have made a career out of accepting invites for junkets, fellowships and conferences in the West in return for spreading misinformation.